Peter promised we would all be young and happy forever." I love retellings and I really love when we get to see a new side of a villain we thought we knew. In this case, we meet the infamous Captain Hook, except he isn’t Hook yet, he is Jamie and Jamie is just a boy. He is Peter’s favorite lost boy and he has been with Peter for almost as long as he can remember. But Jamie isn’t only Peter’s friend, he is friends with all of the lost boys and he takes care of them because Peter is too busy trying to have fun. And this is how our story begins. Jamie is so easy to love. He cares for all of the lost boys and makes sure they are taken care of. He is the best of all the lost boys and while they all love Peter, the one they truly love and admire is Jamie because Jamie loves them too. Jamie was so great and it was hard watching his childhood disillusions concerning Peter fall away. I have a lot more I want to say about Jamie but it kinda goes into spoiler land, so moving on. Aside from Jamie I also ADORED Charlie and Sal and Nod. Charlie probably most of all. Charlie is younger than the other lost boys and he just wormed his way into my heart like he wormed his way into Jamie’s. He is so sweet and the way he adored Jamie just melted my heart. Sal and Nod were also great characters and I loved them. And there were other characters along the way that I loved. But this book does not shy away from the heartache and we lost more than a few people over the course of the book because Peter is not what he seems. So now that we are on the topic of Peter, let’s discuss. This is not the Peter from your childhood. This Peter is very much a villain and he hides his evil under the pretense of childhood games. The thing with this Peter though is I expected him to read more villainous than he did, and don’t get me wrong he is a villain and he is evil but he doesn’t always read that way. Most of the time he reads like a bratty child who needs a time out, except a time out would not suffice as punishment for the things he has done…. so this was a bit hard for my brain to reconcile. Because most of the time I was more annoyed by his bratty presence than I was afraid of him and I wanted to be afraid of him. 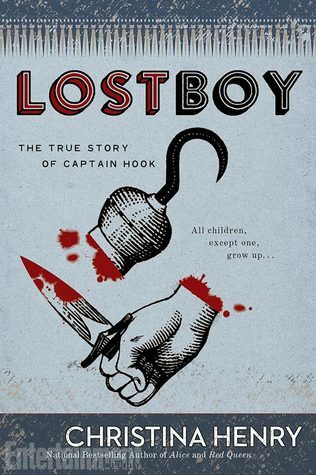 All in all though, Lost Boy is a good read and I really liked this back story for Captain Hook. Going in you know how this has to end, but that doesn’t stop it from upsetting you when you get there. This is definitely one for fans of Peter Pan. I really think you'll enjoy this one! Its such a great retelling!